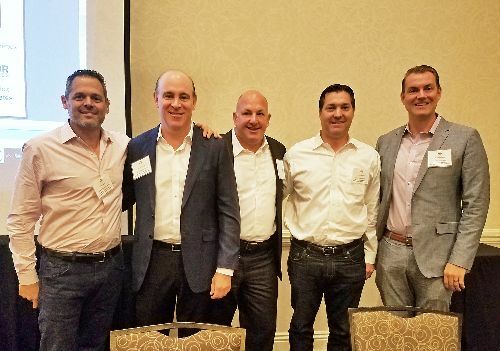 A panel of L.A. office landlord experts discussed changing trends in the market at RENTV’s annual Westside Los Angeles State of the Market Conference, held Thursday, August 17, at the DoubleTree by Hilton Hotel in Culver City. Moderated by John Ollen, Managing Director at Tishman Speyer, the panel also included: Mark Laderman, Co-Founder and Managing Partner at Artisan Realty Advisors; Jeffrey Lasky, Vice President Leasing at Hudson Pacific Properties; Kent Handleman, Senior Vice President Brokerage at Lincoln Property Company; and Paul Miszkowicz, Principal at Harbor Associates. One of the major areas of discussion was about Hollywood and entertainment industry demand, and how the studio/office concept has changed dramatically in recent years. Lasky noted that just seven years ago office space on a studio lot was very limited, but in recent years larger industry companies such as Netflix have played a major role in changing the studio/office model. As with Netflix, they pointed out that much of the studio/office demand is from content providers. Ten years ago, Netflix occupied 12k sf of studio office space; but since then that number has ballooned to around 400k sf. Ollen pointed out that, at present, the occupancy rate for Westside studio/office space is around 98%. And, it was pointed out that Apple is just now getting in the content game. While many local pros are still bullish on this segment, Lasky expressed some concern that the ongoing space expansion by content providers may soon be reaching a saturation point. Within the Hollywood submarket, however, there is such a critical mass of entertainment tenants that related professional services for the industry, such as law firms, feel the need to also occupy space in the immediate area, adding to the demand for limited supply. Turning west to Playa Vista and the surrounding area, Handleman pointed out that the office market there has really taken off in the last three to four years, thanks to recent new projects, better traffic, and what was a rent discount from other Westside submarkets. Those new projects include the Collective, a spec development that opened 100% leased. Handleman noted that existing buildings in the immediate area were also doing very well. Older buildings that were going at $2.85/sf/mo just three years ago are now in the mid-$3’s. A seeming point of consensus by the panelists was that if you build the right product in a good location on the Westside, tenants will pay for it. Laderman commented that in addition to good product, the other critical components of a successful project in the region included strong amenities, proximity to exec housing and nearby public transportation. As an example of a current project slated to meet current tenant demands on the Westside, Miszkowicz brought up a 35k sf building renovation project adjacent to Century City that Harbor Associates recently acquired. The building was constructed in 1982 and had been occupied since 1994 by the seller. Harbor is redoing everything, and putting on a new façade, to provide a tenant the opportunity to turn it into their own branded campus, which they expect will bring in top dollar rents. And speaking of tenant needs, an important topic that came up was the cost of tenant improvement (TI) work. In fact, this has become an even bigger variable in the deal than ever before, which Miszkowicz attributes, in part, to such factors as Title 24, a lack of skilled labor, and a rise in material costs. The panelist consensus is that they can’t do much for less than $70/sf on raw space, which makes the credit underwriting critical the and proformas a bit more challenging to hit. Miszkowicz added that they now have the expectation that TI work at some smaller, older buildings can even reach over $80/sf. At Lincoln Property, Handleman says, they try to use that to their advantage by having a stronger TI package than most competitors, which allows them to punch their face rents up a bit higher. That is why short term value-add projects could be risky, as Ollen pointed out. They are like rolling the dice in terms of market timing. It is easier and safer to jump in the value-add pool when you’re holding for the long-term. An interesting point that Laderman noted near the end of the discussion was about the convergence of tech and media, which has been so huge for West LA. Since the region may be the most difficult place in the country to build new product, he expects expect high-watermark selling prices in this cycle for places like Santa Monica and Beverly Hills to reach $1,000 - $1,350/sf.